When we founded E-Rider back in 2013, we wanted to bring electric mopeds to the marketplace that aren’t just eco-friendly and free of the legal restrictions attached to petrol-driven vehicles, we wanted them to look great too. We think the E-Rider Model 15 Special Edition scooter does just that. Like the standard Model 15 before it, the Special Edition requires no license, insurance or road tax fees, and can be driven anywhere including bus lanes, cycle tracks and roads, by anybody over the age of 14. It also features a stylish digital speedometer, generous under-seat storage and an integrated back box. But that’s where the similarities with the Model 15 end. To make the scooter really stand out from others on the market, we gave it a sleek matt black finish, a Signature logo and a faster top speed of 25kph. For commuters with longer distances to travel, we specified the scooter with a 48v 24ah battery, giving more than twice the range of the standard model. In fact, at four hours driving time, the Special Edition goes for longer than a Tesla and can be driven distances up to 100km off a single charge! We’re now entering the midway point in our big Summer Sale. For August only, we’re giving you £400 off every model in our range, meaning the Special Edition is available for just £1295 including standard delivery. But be quick, it was named the Special Edition for a reason, only 40 of these fantastic scooters were made and they’re selling fast. The model was only released earlier this month and they’ve flown off the shelves since with less than half remaining! So don’t miss out, get your E-Rider Model 15 Special Edition. If you require any further information, please get in touch. How do I get my chassis number, need for insurance? Hi anyone know the best cover to get as I may have start to leave it outside when I am in work. I have only had the E-Rider 15 SE, few days now but enjoying all so far. I did have issue with delivery time from courier, but Ken did step in and got delivered earlier ( Thanks ). Bike looks good and all in good working order. Will comment more later on as only used for few minutes as checking All was working. Hi, I have had my E-rider Special Edition for two weeks now and love it. Initial problem with charger cable was sorted within a week at no extra cost. Thanks to Ken and his staff for swift after sales service. Great little bike which turns heads where ever I’ve gone with it. My wife road pillion on it with me and loved it. Looked at other cheaper brands before deciding to purchase this bike but glad I waited for this one. 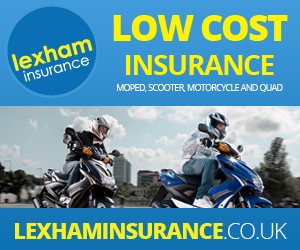 Even though insurance is not a legal requirement, I have insured mine at a cost of £83 for the year, just in case. Would recommend it to anyone and have. Thanks again Ken for providing a great product, love it.